Last November, the National Building Museum opened an exhibition of American landscape architect Lawrence Halprin’s body of work on the centennial of his birth. Halprin’s imaginative and interactive landscapes were characterized by the use of expressive natural forms, through which he sought to bring outdoor life back into the city. Through techniques such as styling concrete to echo rock formations and employing flowing, terraced water features to evoke the natural wonder of waterfalls, Halprin took visual and tactile cues from the progenitor of all designers -- nature -- to create an impressive portfolio of environments that promotes health and nature play within communities to this very day. Although Halprin died in 2009, the biophilic design movement continues his legacy in spirit through an evolution in thought within the fields of architecture and landscape architecture. Biophilic design is a space-making methodology deeply influenced by the relationships, processes, and forms commonly found in nature. When applied to the built environment, biophilia manifests through visual or tactile analogues as well as the articulation of natural qualities such as daylighting, vegetation, and outdoor views. This is often accomplished through the use of natural materials, such as wood and stone, and ensuring that spaces are well-lit, breathable, and permeable: embracing nature’s rhythms rather than trying to control them. For decades, cities have suffered the ramifications of inadequate access to nature in the form of urban decay, and the tide has thus shifted towards restoring nature to the built landscape through the use of biological relationships to facilitate access and play. The constant question remains: how can we easily begin to use biophilic principles to promote community interaction in equitable and healthy constructed spaces? As a naturally biophilic material, unmilled wood has the advantage of being a low-impact, renewable resource that is both strong and versatile in a variety of building applications. It has been shown that trees in community spaces promote public health. Stands of trees have a tendency to draw people in, inviting them to pause, observe, and interact with each knot and branch instead of merely passing through the space. 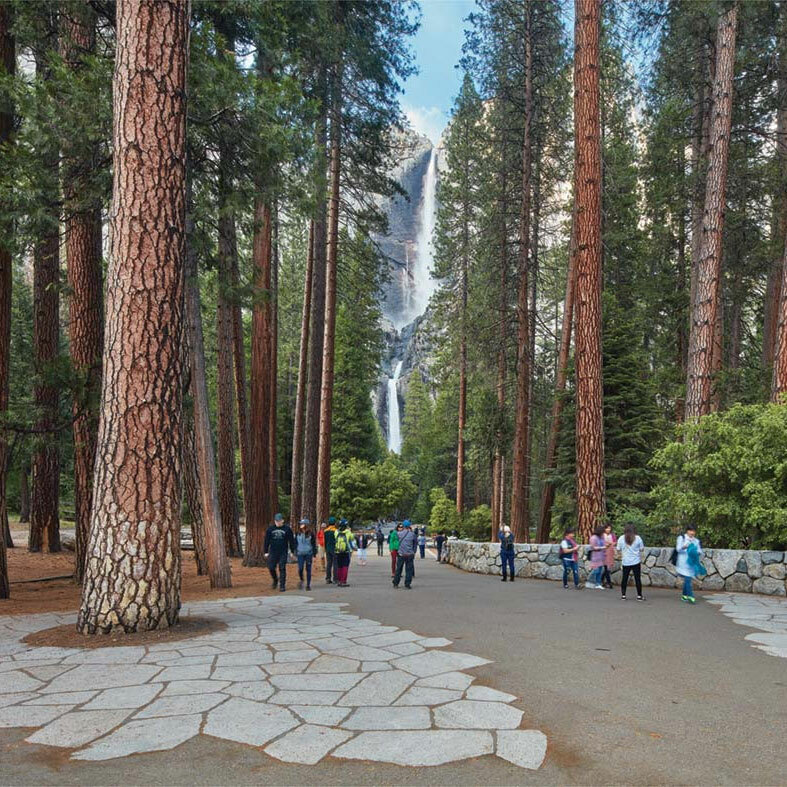 The sense of awe and wisdom of the forest becomes a useful facet of biophilic design, where trees are strategically employed as visual and structural elements that can literally bring visitors back in touch with nature. Indeed, architects have begun to incorporate whole trees as design features in high-design projects as well as simple urban installations. Yet, in an era where the earth’s resources are increasingly under threat, how can we meet the demand for biophilic building materials in a manner that is both beautiful and responsible? WholeTrees prides ourselves on working with the inherent qualities of natural wood, hand-peeling the bark and leaving most of the tree unmilled. Our “growing-edge” practices preserve the intrinsic character of each tree while rendering them suitable as building material. The Hanifl Family Wild Woods at the Minnesota Zoo in Apple Valley, MN, showcases many potential uses of trees within a single, interactive landscape. The tree structures are climbable, walkable, and touchable in the forms of log piles, monkey bars, pole climbers, or the supports to a playscape maze. By designing the environment to encourage exploring and interfacing with trees, WholeTrees and its collaborators produce structures and environments that work in concert with nature -- not against it. Since our trees are harvested from waste streams in sustainable forest management, choosing this material over commercial steel or dimensional lumber stores carbon and keeps chemical-intensive manufacturing and finishing processes to a minimum. In addition to being closer to nature, trees are stronger and greener than wood. Halprin’s midcentury work reflected a "rugged" vision of nature that encapsulated the wild beauty of natural landscapes, while rendering their health-giving benefits accessible through everyday workplaces, neighborhoods, and urban parks. Nature holds many delights within numerous details, relationships, and systems that can bring wellness and delight to the urban landscape. The key to embracing biophilic design is highlighting, not erasing, perceived irregularities found in nature such as the unpredictably intriguing forms of the woodlands. By implementing trees in all of our living spaces, from playgrounds and streetscapes to schools and grocery stores, perhaps we can move towards cleaner cities as well as stronger forests.